You want to — you need to — get change going within your organization, and quickly. The question is, “How do we get started?” Luckily, there are multiple ways to facilitate change within your organization. Your own assumptions about what motivates people will determine the success or failure of your change program. If your assumptions are incorrect, you may miss a valuable opportunity, that of gaining stakeholder ownership of the change process. “Why is this?”, you ask. People do what they do for a reason. A person’s behavior (what we observe) is an expression of their underlying beliefs and assumptions. To make our want to facilitate change appealing to others, we must understand why they do what they do. What are they dissatisfied with? How do they feel about the planned changes (Vision)? What steps will provide a good Return on Investment (ROI)? And finally: What resistance must be overcome to succeed? We now have a baseline of the key issues for each stakeholder. The next step is to select the ones that you can realistically alter and develop targeted strategies to alter them. People won’t change unless they feel safe, secure and in control over the results. You can’t just force people to change by management decree. To facilitate change, you must change their underlying assumptions with a credible plan. List what assumptions need to change. Include a strategy for overcoming the resistance to change identified for each stakeholder group. The strategy should fill the gaps. Increasing dissatisfaction with the status quo should improve motivation. Increasing the vision element will ensure the program is completed. Increasing first steps will make sure the program gets started. Lastly, decreasing resistance will simplify the whole effort. Measurements define the culture of an organization, so it makes sense they would be a good way to facilitate change. What you measure is what you manage, and the person that does the measuring is the manager. In order to change the outcome, we must change what is measured and (possibly) who or what is doing the measuring. Think about this a little. The person or thing measuring is receiving feedback, the result of prior changes. This is known as a control loop, or a “feedback loop”. If the one measuring can’t make changes or the one making changes can’t measure the results, the resulting delays are significant wastes that cause serious troubles. Leaders define the performance standards, or measures. You can’t introduce new measurements into the organization and then continue to ask for the old ones. If a leader keeps asking for old information, people give it to him or her. If a leader seems to counter the aims of your change program, the people being led will respond the same way. One way to facilitate change is to define what needs to change in as much detail as possible. For example, you can’t just say, “Salespeople need to be friendlier to customers.” You have to define “friendly”. You have to communicate the characteristics of friendly behavior, such as “greet customers warmly”, “ask about their concerns”, or “address them by name”. Once you know what the behavior looks like, translate it in detail to employees and reward them immediately for doing it. Reward those who change and acknowledge their contributions. In order to facilitate change, you must focus your attention on people who change and ignore those who do not. This will send the message to others that you value the changes made and, in turn, encourage others to participate in the change program. To derive the greatest benefit, the reward — material or not — must be immediate and public. Make sure you have a regular method to capture where the organization stands with respect to the change program. Is the current dissatisfaction, vision, and first steps level greater than the resistance to change? People are not mechanical systems: their behaviors are the result of internal beliefs and assumptions. We must measure and monitor the progress being made to ensure that the change program is having an effect on those beliefs and assumptions. If given the option, most people will opt for the devil they know rather than the one they don’t. 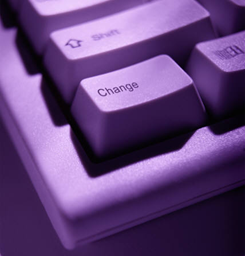 Increasing the values in the change formula will help facilitate change and bring about behavior changes. However, it alone will not make them stick. Organizational culture is far more persistent than many people allow for. Change must be an iterative, interactive, and ongoing process. It is definitely NOT an event. Go back to the first step and update the change baseline. Discover new changes that are needed. Develop new change strategies and keep up the change.